Step 1: Give us your wish list! Please fill out and submit this form. A representative will contact you after your submission to finalize your itinerary details. What is the age range of your party? What part of town are you staying in? Which day do you arrive in Nashville? Which day will you leave Nashville? 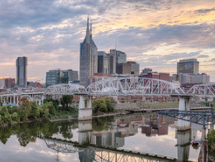 How do you prefer to travel while you're in Nashville? call an Uber or Lyft. get a Segway or Bird scooter. walk and ride local transportation. will have my own car. Please provide information regarding special requests. Customized Itinerary Complete your transaction by purchasing your itinerary.